Change is in the air, nothing stays the same forever including a suggested recipe for warm weather vegetables from Around My French Table by Dorie Greenspan. Referred to as a springboard recipe and in my case it was also an ‘everything but the kitchen sink’ recipe as I reached deep into my fridge to pull out my jar of preserved Key limes and a leftover grilled corn on the cob from the holiday weekend. A handful of arugula with sliced radishes, a drizzle of arugula pesto and a poached egg completed my vegetable pot-au-feu. Thinking it might look like a déja vu from French Friday a few weeks ago when the poached egg was cut to show the runny yolk coating the asparagus, I decided to celebrate the whiteness of my poached egg by leaving it untouched in the photographs. I think it looks calmer, a bit more subdued in this state, what do you think? 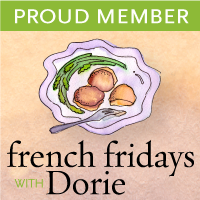 Please check out the Doristas contributing their links here at French Fridays with Dorie, just remembered I added sea salt with freshly ground black pepper and fearing blandness a few pinches of ground Aleppo peppers. How refreshing the vegetable pot look! Love the green, pesto and the veggie assortment in the recipe. The pesto and radishes in your soup look so tasty! And, I was thinking about radishes at the farmers market but decided to go against it. I'll have to try it again with them. Great post! Beautiful! It does remind me of the Asparagus salad from a few weeks ago. But I love this one. Love all those beautiful veggies. Looks beautiful, Patty… almost too pretty to eat. Almost! A wonderful combination of ingredients here, perfect with the poached egg and I love addition of preserved key limes. I love that you used the radishes. It's nice to see them in something other than a salad! Beautiful presentation! Really beautiful, Patty! I accidentally skipped ahead, but I will have to make this, too. I have arugula growing in my garden. Have a lovely weekend. Your soup looks beautiful. Love your photos! I love how the coulis jumps out in the picture. Those ingredients are show-worthy. I had radishes and didn't think of adding them in! wow I am speechless with your veggie soup creation. Have seen quite a few of pot au feu these days, but yours is definitely the best! Your fridge seems to be a treasure trove, Patty. How lucky for those that eat at your house. I love all the colors. The radishes are a nice addition. Wish I'd thought of that, but will remember for next time. Arugula pesto, too! I did think of using baby arugula instead of spinach, so maybe I'll do that next time too. “Springboard” is the right descriptor. This is a new favorite for me too. Enjoy the weekend! Pot-au-feu never looked this good before Patty. I agree with Denise. Simply stunning. Yes, your egg has an air of tranquility A delightful spring pot-a-feu, everything-but-the-kitchen-sink dishes are a specialty of my kitchen and the arugula pesto and preserved key lime flavors you added gave it a big flavor boost I'm sure! Your pot-au-feu is beautiful. The vegetables really take center stage, and I love the egg left unbroken. I wasn't sure how I would like a poached egg in my soup, but I loved it! What gorgeous photos of those ingredients! That's one beautiful soup. One day I hope to get back to FFD- I miss it when I see everyone posting! 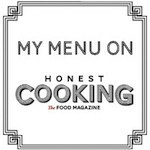 Your site is lovely and the photos are just perfect to compliment a recipe by Dorie. Her dishes are exceptional.